Impossible is Nothing by Iggy Azalea --not necessarily my type of music, but the chorus is got a good vibe…although, it definitely has the right feel for Angel. She's really stepping up and kicking her life into high gear. She's not letting anyone stand in her way. If you've heard that this edition in the series is on the slow side, that would be true…although an easy fix to this is to listen on Audio. Allison McLemore was excellent as the voice of Angel. It was totally a good call using my audible credit for this one. Despite the slow-ish pacing, I really found myself liking Angel even more than I already did. Once the action kicks up a notch; this was a quick, entertaining listen. 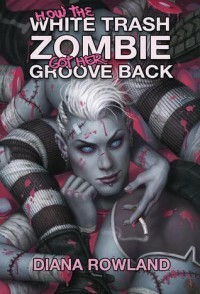 I highly recommend this series, especially if you prefer a zombie with a functioning brain. Book Cover: 3/5 I complain about the covers for this series every time because they always show her smoking a cigarette. To me, cigarettes are tacky, and icky.